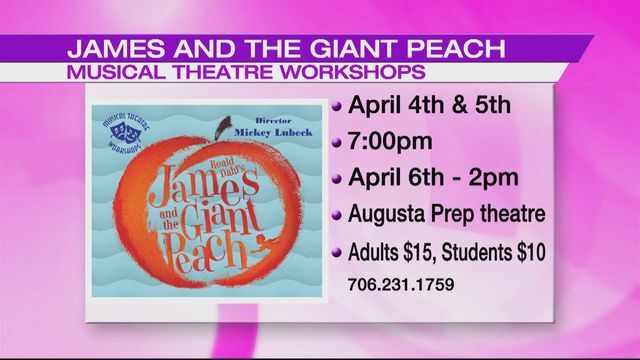 AUGUSTA, Ga, (WJBF) - Musical Theater Workshops is presenting a fun musical this week, and through the weekend, James and The Giant Peach. It is fun for the whole family and to tell us more about it, please welcome MTW founding director, Mickey Lubeck and Daniel Bagi, who plays James. "So, James is a young boy who lost his parents when he was younger, so he was sent to live with his atrocious aunts and they were very mean to him. And then he meets this magical person and they make a potion but James drops the potion and makes a peach grow with insects growing, makes the insects that ate the potion grow larger. And then they, James crawls into the peach and meets these giant insects, and, you know, he's a little scared at first. But then they go on incredible adventures- and sing really cool songs!" "It's all about, its really all about family because he knows what family really suppose to be and these atrocious aunts are not family. And so, he develops a whole new family within this lovely giant peach. And there is a happy ending, just letting you know." Mickey says she's lost track of the number of years she's done musiclal theatre with kids, but she's been proud to watch the career paths so many of her young performers have taken. "Some of them have gone on in the business of musical theater, and some have gone into film or commercial work, but most of them, they go on and do, they become lawyers and doctors and teachers and some of them even become drama teachers, Yay, I'm very proud of that. I truly believe that theater is something that everyone should try, and I know that there are so many that worry about their children being shy and introverted and they're like, oh they would never do theater, and I'm like well, bring them over here and we'll develop their confidence by doing improv and silly exercises."